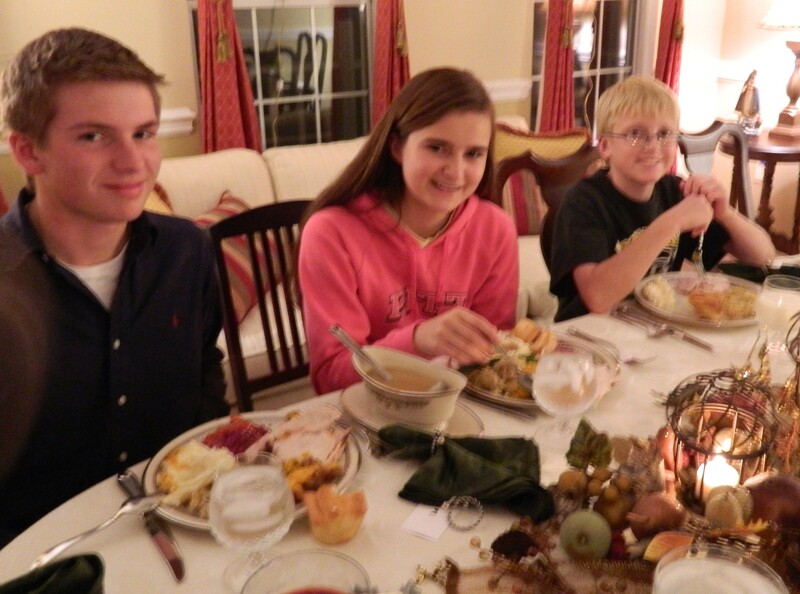 Thanksgiving Day brought family together in our home—Kelley’s, Garneau’s and McKinney’s—for feast and fun. The best part for me was the relaxing time to visit with everyone and enjoy the day. Why? Because I prepared everything ahead of the actual day. Here’s the menu and the plan. Bookmark this page for next year or adapt it for Christmas. 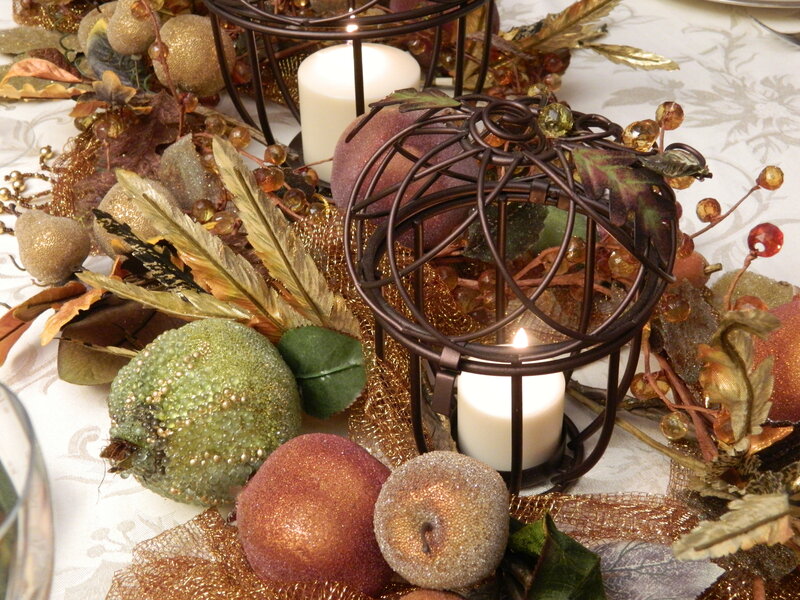 You, too, can serve up your best and enjoy both your holidays and your guests. You might say, “How can a person who works full time accomplish all this?” I say, this method is really great for the working gal or guy or busy stay-at-home mom—you shop and cook when you can—in the evenings, weekends, or early mornings. You chip away at your assignments and it becomes fun not a chore. Three days or so ahead, whenever you can, prepare your table. This gives you time for creative editing. Simple and light munchies were served outdoors by the smoker, the fire pit, and football on the outdoor screen. Luckily, the weather was about 70 degrees and folks worked up an appetite by throwing the football in the yard. Smoked Turkey—The perfect brine included a recipe of pungent spices called Bonedust. The turkey is washed and brined a day ahead. Even if you roast it in the oven, wash and brine the turkey a day ahead so all you have to do is season it (and stuff it if you wish) right before you put it in the oven. Traditional Bread Stuffing—Dry the breadcrumbs one week ahead and save them in the refrigerator. Cook the onions, celery, apples, spices and herbs in butter two days before Thanksgiving and refrigerate. Reheat the butter mixture in the microwave the day before Thanksgiving and mix with bread crumbs. Put the stuffing in a buttered casserole dish. Note: Safety never takes a holiday! If you plan to stuff the turkey, please don’t stuff the turkey ahead of time. It must be stuffed just before roasting erstwhile you get food poisoning. I didn’t stuff the turkey because it was smoked. 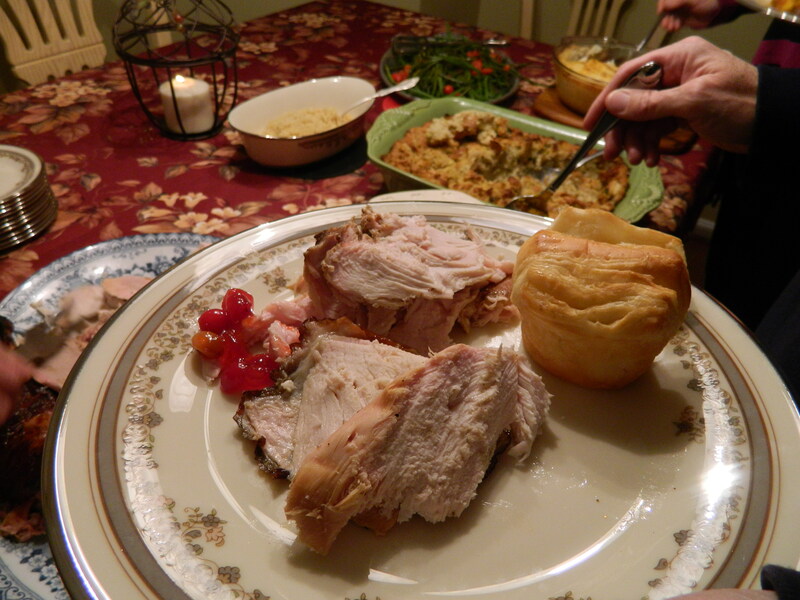 Gravy by Bobby G.—Root vegetables, herbs, turkey neck and giblets made this gravy tasty. Guest Chef Bobby G. made the gravy while the turkey smoked outdoors. He stirred it a lot! (But I think he just likes to do that.). You could make your stock ahead of time when you clean the turkey. Refrigerate and continue cooking when the turkey is roasting. Mashed Potato Casserole—Make a week or two ahead and freeze. Thaw well ahead of baking. Recipe below. Sweet Potatoes—Make a week or two ahead and freeze. Same as above. Recipe below. 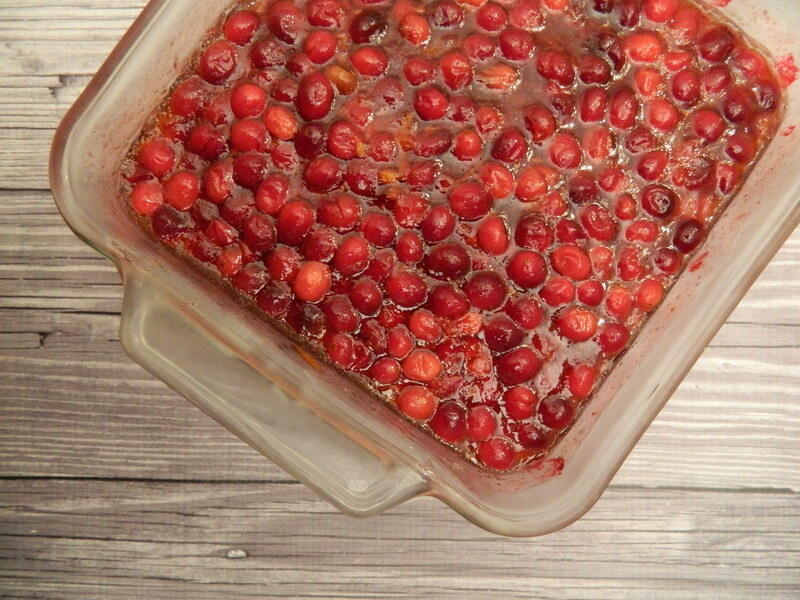 Baked Cranberry-Orange Sauce—Make up to four days ahead. Put in serving bowl, cover with wrap. Can be served hot or cold. Sauté of Haricots Verts and Pearl Tomatoes—Wash green beans and tomatoes the day before and cook about 20 minutes before the meal is served. Sauté some shallots in olive oil. Add the green beans and steam until tenderly crunchy. Add tomatoes. When warm, season to taste with salt, pepper and balsamic vinegar. Rolls and Butter—I purchased some yeast rolls from the bakery the day before and heated them. Or make your own a week ahead and freeze them. 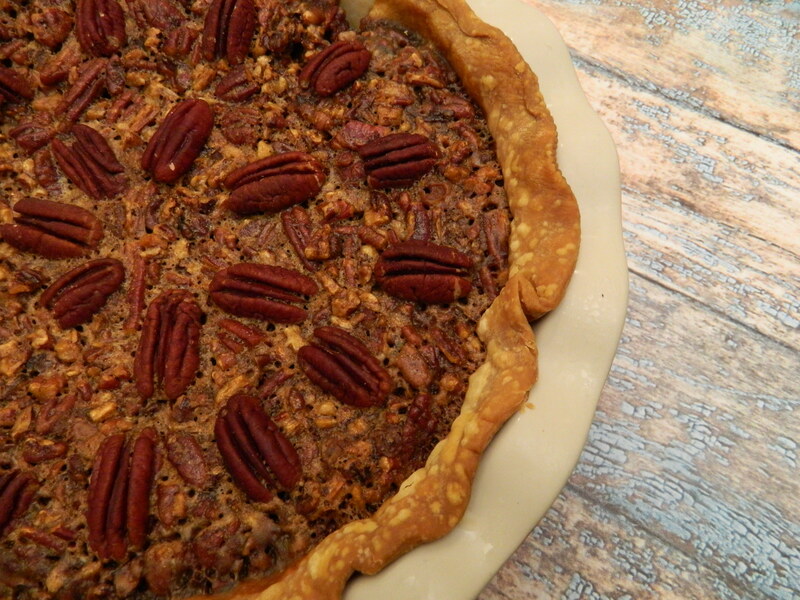 Bill’s Pecan-Bourbon Pie with a Touch of White Chocolate Bill made this scrumptious pie a week ahead and froze it. Take out of freezer on Thanksgiving morning. 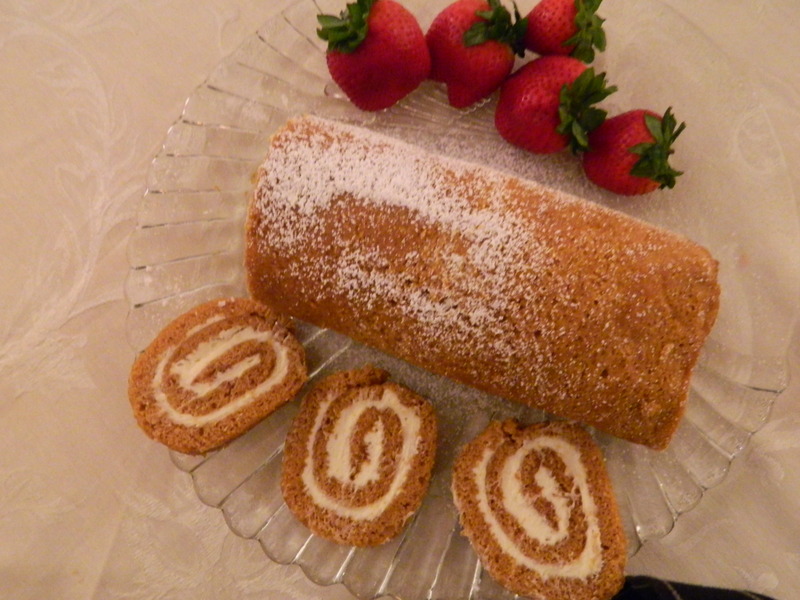 Lucille’s Pumpkin Roll — Make it several days ahead and freeze. Put in the refrigerator to thaw. 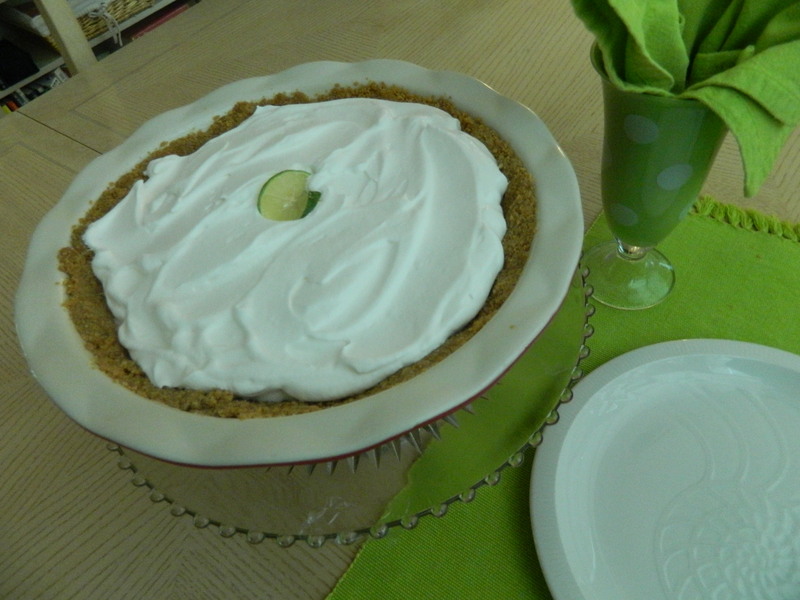 Key Lime Pie—Make the graham cracker crust a week or two ahead and freeze it. Make the Key Lime filling the morning of Thanksgiving and top with fresh whipped cream. This takes no time at all! The filling is a “piece of cake”…well, I mean pie. Thanks to our friends in Spain, Javier and Cristina, we had some of the finest wine of Rioja region, delivered from Spain to our door via a vintner in McLean, Virginia. 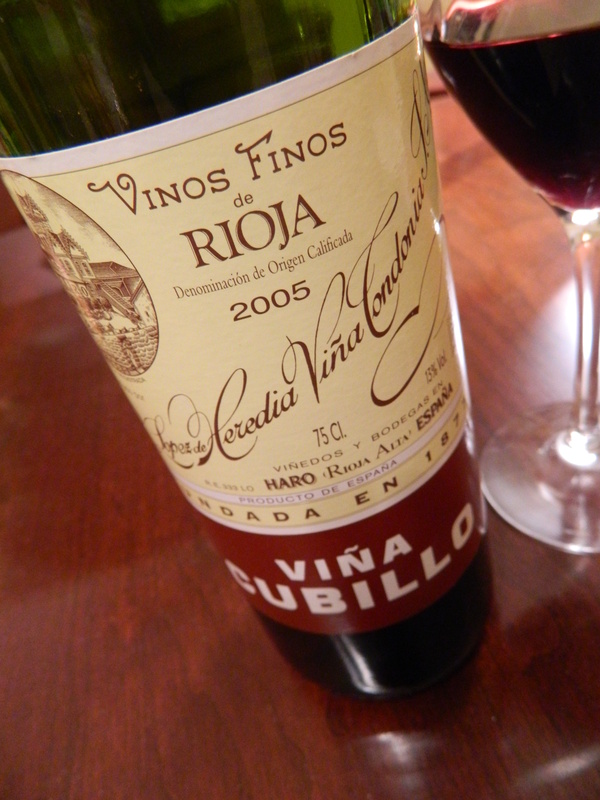 We enjoyed Vino Cabillo (2005) from Bodegas Lopez de Heredia winery, better known as Tondonia or simply Heredia. I don’t know if this varietal was the best choice for turkey. However, we loved it and its boldness stood up to all the various foods. Plus, we toasted our friends with their wonderful gift. Thank you to our Spanish friends! For the other recipes, click on the live links. A Kentucky gal, Nova Jean Monroe, gave me this recipe years ago and it is a mainstay at holiday meals. Go University of Kentucky Wildcats! Cook potatoes in water, 25-30 minutes, until tender. Drain well. Mash potatoes gradually adding salad dressing, cream cheese, onion, salt and pepper. Spoon into 1-1/2 quart casserole dish. Sprinkle with paprika. Bake in 350 degree oven for 45 minutes. This freezes well. Do not bake and cover tightly and freeze. To serve, thaw casserole. Heat oven to 350 degrees and bake for 1 to 1-1/4 hours or until thoroughly heated. I first enjoyed this at Thanksgiving 1997 at Bobby G’s house in Raleigh. Bake in a casserole dish at 350 degrees for one hour. Freezes beautifully. Thaw completely before baking. Hint: Mark all your do-ahead items in foil and write with a permanent marker on the foil its name and cooking instructions, including how long to thaw, and/or what time to thaw or bake. This avoids having to backtrack and find recipes at the last-minute. Last, since all your cooking is done well ahead of time, you can tidy up the kitchen, clean up your prep mess, start with a clean sink and an empty dishwasher, and you’re good to go!